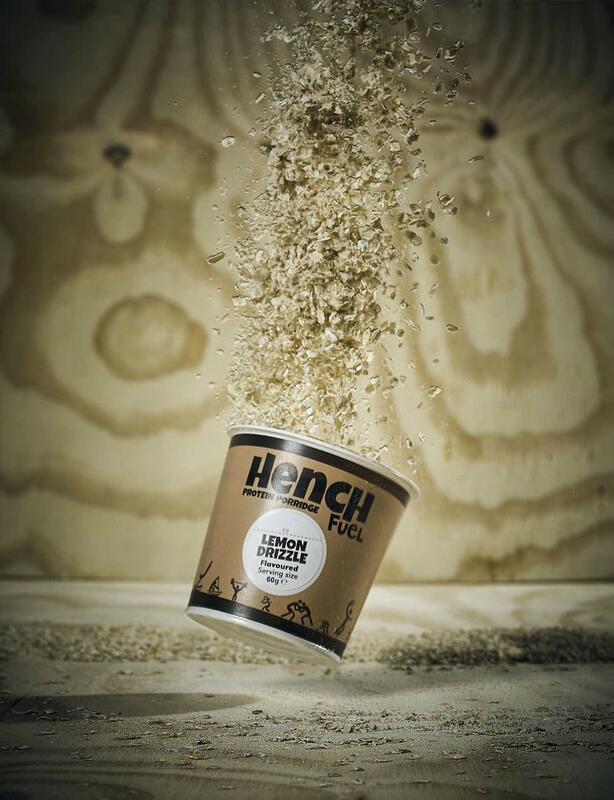 Founded by ex-GB tennis athlete Paul Simmons, Hench Fuel had ambitions to take on the fitness nutrition market with a unique protein-based porridge that was convenient, low in sugar and only used natural ingredients. A fun and fresh brand identity was required to launch the product in two defined market segments: not only the specialised CrossFit market for which founder Paul had links, but the larger market of aspiring fitness athletes ranging from teenagers to 40+ masters athletes. The brand needed to be as big and bold as the ambitions of the business – and adaptable to be rolled out across all aspects of the brands visual identity, including packaging, web presence, sponsorship and clothing. Following a competitor analysis and branding workshop, we established the optimal brand position for Hench Fuel – developing a number of branding solutions that reflect the ‘cheeky, funky and simple’ brand personality that would set the product apart from competitors. The chosen brand was rolled out across packaging design, merchandise and clothing ahead of the product launch. In the first year Hench sold 60,000 units. Since then, the product has gone from strength to strength and is currently in 150 establishments across the UK and is now growing internationally with orders from Holland and a strong interest from Denmark. "I had the idea for Hench Fuel whilst working alongside a number of fitness professionals, it wasn't until I engaged with sevenseven that I could truly bring the brand to life. The guys really understood my requirements and have created a brand that has gone from strength to strength. I can hand on heart say I wouldn't go anywhere else for my design requirements and wouldn't think twice about recommending the guys at sevenseven."